A downtown walking tour is a must when you travel to Elizabethon, Tennessee. 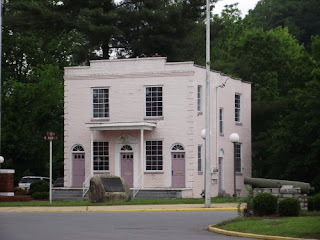 This historic jail in Elizabethton, Tennessee was just off of the traffic circle. Visitors can walk to it from the park. Among the historic buildings and sites in Elizabethton this one stood out. This particular building is right next to the Carter County courthouse. It stood out because it's not every day that you see a building of this vintage that's painted in pink. The second thing is the old structural charm that captures the interest and the imagination. Visitors who travel to Elizabethon, Tennessee is a pretty interesting place to visit. History is the word of the day and the walking tour is just the beginning. Did you know that Elizabethton was the first permanent settlement to be established after the original 13 colonies? I didn't know that until we took our road trip. I was also surprised to find out how important this area was to the early development of the U.S. When you think about U.S. history you think about cities like Boston, Philadephia, DC or Richmond. Carter County, Tennessee usually doesn't usually make the list of top 15 of historic hotspots. That's a shame. Carter County was the site of the Transylvania Purchase. This private land deal opened the land between the Kentucky River and the Cumberland Watershed to settlers. It was important for travel, settlers and for the development of commerce. Carter County, Tennessee was important to the democratic development of the U.S. It was the home of the first majority rule style of government. The Watagua Association formed here to meet the early governmental needs of this area. It also laid part of the foundation of our democratic form of government. To me, that's impressive enough to wish that I'd paid more attention to my high school history classes. If you snoozed in class don't worry. A road trip to Elizabethton, TN will fill in some gaps. When you travel there be sure to visit Roan Mountain and the Pisgah National Forest and Sycamore Shoals State Park. Find out more travel here on the article; Carter County/Elizabethon Chamber of Commerce. Charlottesville, VA has a really amazing Historic Jail near its downtown area called Court Square. I directed a short documentary piece on the Jail and the area around it which you can watch at http://bit.ly/vtFs1g if you go under Featured Videos and select "Old Charlottesville Jail". I've lived in Charlottesville for almost ten years and had no idea it was there until a friend told me about it. Thanks for stopping by and signing the blog. I just came from visiting Silver Streak Media. The documentary piece looks great.